The shield is derived directly from the earliest period of Senneville’s recorded history, when Jacques LeBer was seigneur. He was the builder of “Fort Senneville”, the community’s most historic structure, which, in this instance, symbolizes Senneville’s heritage and the community as a whole. LeBer’s coat of arms, recorded in the Armorial Général de France on 13 June 1698, was a blue shield with two palm branches crossed diagonally and two stars, all in gold. These arms are drawn upon for the principal colours of the design and the palm branches. The coronet links the maple leaf with the fleurs-de-lis that are also found in the arms of Rouen, episcopal seat of the diocese containing LeBer’s birthplace in Normandy. 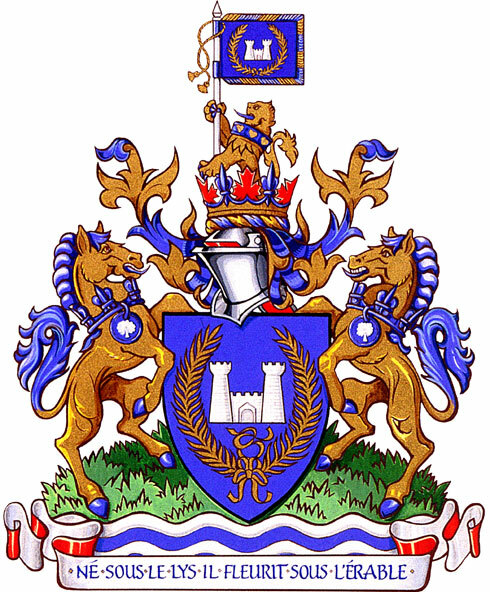 The lion, a traditional symbol of strength and spirit, is a reference to the arms of Normandy and of England, ancestral homelands for many of Senneville’s citizens. The lion carries a banner of the village, representing the citizens’ determination to uphold the community’s interests and protect its amenities. The lion’s collar honours LeBer’s wife, Marie-Anne-Claude de La Cour, whose arms, featuring three yellow hearts on a blue shield, were also recorded in 1698. The stallion and mare stand on a bed of green grass, for the lands of Senneville. The blue and white wavy bars represent the Lake of Two Mountains and recall another aspect of Senneville’s history. The male and female horses honour Senneville’s agricultural and pastoral heritage and represent the men and women who have built the community over the generations. The alternating maple leaf and fleur-de-lis coronet ties the design to the crest and motto, while the tree recalls Senneville’s richly forested environment. Meaning “Born under the lily [of France], flourishes under the maple [of Canada]”, this phrase captures the history of Senneville.